Known as "Federal One" for short, Federal Project Number One was created in 1935 as a subdivision of the Works Progress Administration (WPA) that sought to extend the relief of the New Deal to artists, actors, writers, and musicians. Although the arts had never been high on FDR's list of priorities, he felt funding them would provide a double benefit. Not only would it put legions of unemployed artists back to work, but their creations would invariably entertain and enrich the larger population. If FDR was only lukewarm about Federal One, however, his wife more than made up for it with her enthusiasm. Eleanor Roosevelt felt strongly that American society had not done enough to support the arts, and she viewed Federal One as a powerful tool with which to infuse art and culture into the daily lives of Americans. ER lent her wholehearted support to the creation of the Federal One programs, lobbied FDR to sign the executive order creating them, praised the projects in her columns and speeches, and defended them against congressional critics. ER felt particularly attached to Federal One's Federal Theatre Project and she delighted in the artistic work that she saw being crafted with federal dollars. 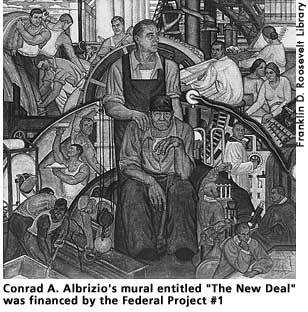 Not surprisingly, Federal Project Number One was a popular target of the New Deal's reactionary opponents in Congress. Martin Dies, the cantankerous chairman of the House Committee on Un-American Activities, detested Number One with particular intensity and sought to use his power as chairman to expose Communist subversion within the organization. Along with his conservative allies in the House and Senate, Dies had successfully pressured the White House to scale back Number One by the late 1930s. The first program to go was ER's beloved Federal Theatre Project, which Congress dissolved in June 1939. This was quickly followed with budget cuts for the Federal Writer's Project, the Federal Music Project, and the Federal Art Project. By the end of 1942 these programs had virtually been legislated away and in June 1943 they officially ceased to exist with the WPA's dissolution. Black, Allida M. Casting Her Own Shadow: Eleanor Roosevelt and the Shaping of Postwar Liberalism. New York: Columbia University Press, 1996, 33-36. Cook, Blanche Wiesen. Eleanor Roosevelt: Volume Two, 1933-1938. New York: Viking Press, 1999, 267-268. Graham, Otis L., Jr. and Meghan Robinson Wander. Franklin D. Roosevelt, His Life and Times. New York: Da Capo Press, 1985, 133-136.